Anita Campbell has a very nice review of Patent Pending Blog, at the Powerblog Page. Since talking with Anita earlier this year, I have noticed that this site, Blawg Review, is a great place to learn about law blogs. Anita also hosts Small Business Trends, which always keeps one informed of great items for small businesses. Thanks for the plug, Anita! Mike McMillan is a smokejumper and a photographer. He divides his time between Alaska and the lower 48, and photographs the fires he works on. 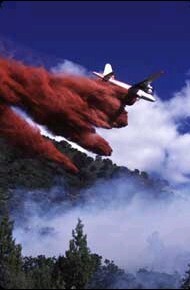 He has a great site at SpotFireImages, which features his wildfire photos. Check it out. Anita Campbell has great taste in blogs! You can tell by looking at her blog Small Business Trends, and by her favorable review of Patent Pending in her monthly Powerblog review. Anita selects one blog each weekend, and writes an in-depth review of it. All of her selected blogs are related to small businesses, entrepreneurs, business startups, and sites related to those people and their efforts. It was very kind of Anita to include Patent Pending in that group of well received blogs. Thanks!! Small Business Trends has posts of interest to business people, and often includes pieces written by guest authors, and excerpts from prominant magazines. Reading Small Business Trends keeps you informed from many sources that you wouldn't get otherwise. Please check out Hans- Peter's technology/ science site, called Mathematick Technick Algorithmick Linguistick Omnium Gatherum. It contains his unpublished papers, some of which try to match scientific and technical areas which sometimes seem to be far apart. "They try to open your mind for solving convential problems with unconventional methods. Some seemingly difficult questions have trivial answers - if you see structures others don't see. Some apparently simple questions may lead directly into a black algebraic abyss. Some solutions which seem to work are simply misleading. This site could be understood quite well as a history of flaws and wrong arguments and of the development of modern science. This site is a collection of nonworkable machines, stupid ideas, riddles, open questions - and spurious useful algorithms, historical remarks and unconventional mathematical approaches, which are placed here for discussion." Some articles are in German, some in English. Enjoy!